Because the story is continuous and specific dates are mentioned several times throughout the chapters (e.g. 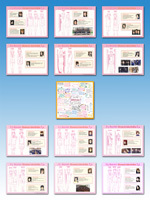 the date of seniors’ graduation: March 1, 2010), the timeline for the entire series can be reconstructed with reasonable precision. Publicly available information about dates (public holidays, start/end of school terms in Japan, etc) was used to narrow down the time of specific chapters where applicable. Tainaka Ritsu convinces Akiyama Mio and Kotobuki Tsumugi to join the Light Music club. First appearance of Yamanaka Sawako-sensei. Hirasawa Yui joins the club. First appearance of Manabe Nodoka. Yui buys her guitar. First appearance of Hirasawa Ui. 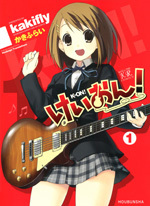 Yui begins to learn how to play guitar. Yui fails mid-term test. The girls come to Yui’s house to help her study for the make-up test. The girls are having summer training camp at one of Mugi’s villas. Sawako ends up becoming the club advisor. The girls are getting ready for the school festival. Mio writes the lyrics for Fuwa-Fuwa Time (Light and Fluffy Time). First mention of MugiVision. School Festival. Fuwa-Fuwa Time is performed for the first time. Mio has an “accident” on stage after the performance. December 2007, Dec 24, 2007 Christmas party at Yui’s house. Jan 4, 2008 First shrine visit of the New Year. Winter 2008 The club faces disbandment unless it can show some tangible results of its activities, such as increase in membership. March 2008 End-of-term exams. Overnight practice in the club room. March 2008 Prospective new members come to observe the Light Music club activities. First appearance of Suzuki Jun. April 2008 The girls are recording introduction video for the club. First appearance of Nakano Azusa. April 2008 Welcoming concert for the new students. 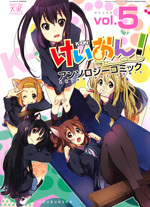 Azusa comes to join the club. April 2008 Azusa sees what the club is really all about and snaps. Spring 2008 Sawako brings nekomimi to the club. Yui gives Azusa a nickname. 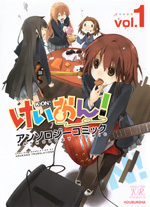 Spring 2008 Azusa teaches Yui guitar and gradually begins to accept the ways of the club. Summer 2008 Yui and Ritsu study for the end-of-term exams. Summer 2008 Second-year training camp. Summer 2008 Ui and Azusa go out. September 2008 New term begins. Yui’s guitar is taken to the music store for maintenance. Autumn 2008 Sawako comes up with the band name. Girls pick stage costumes for the school festival. Autumn 2008 Yui catches a cold. Ui comes to the club pretending to be Yui. Autumn 2008 Second-year school festival. Winter 2008 End-of-term exams. First appearance of Horikomi-sensei. Dec 22, 2008, Dec 31, 2008 End-of-year party at Yui’s house. ??? The girls talk about upcoming anime adaptation of the manga and come up with signatures for autographs. First week of Jan, 2009 First shrine visit of the new year. January 2009 Special training session for Mio to help her overcome her stage fright. February 2009 Mio is being stalked. First appearance of Sokabe Megumi. February 2009 Azusa’s Valentine’s Day. March 2009 Spring cleaning in the club room. 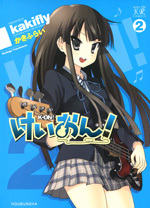 The girls sell Sawako’s old guitar. April 2009 School year starts. New student welcoming concert. Spring 2009 The seniors are choosing universities to go to. 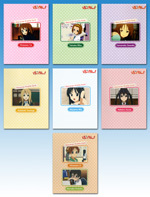 Mugi’s and Nodoka’s choices are revealed. Spring 2009 School trip to Kyoto. June 2009 Rainy season. Mio’s bass and Azusa’s guitar get their names. Summer 2009 The girls are trying to get an air conditioner installed in their club room. Summer 2009 Ritsu and Mugi go out. Summer 2009 Sawako takes the girls to an outdoor music festival. Summer 2009 Azusa, Ui, and Jun spend a day at the pool. Jun promises to join the club next year. Sometime during 2008-09. Mio and Ritsu talk about the beginning of their friendship. Summer 2009 The girls hang out at Mio’s house. Makeover/Impersonation contest. September 2009 The girls write lyrics for the new songs. Ui catches a cold. Yui writes “Gohan wa Okazu” (Rice Is A Side-Dish) and “U&I”. Autumn 2009 “Romeo and Juliet” is chosen for the seniors’ class school festival performance. Mio and Ritsu practice their parts. Autumn 2009 School festival: play and concert. Sawako makes T-shirts for the band. 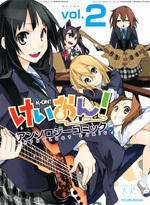 Nov-Dec 2009 The seniors begin to study for the entrance exams.Yui, Ritsu, and Mio decide to go to the same women’s university as Mugi. December 2009 Azusa spends time alone with Mugi in the club room. December 2009 Sawako catches a cold and the girls visit her at home. December 2009 The seniors are taking mock entrance exams. December 2009 Mio thinks that Ritsu has a boyfriend. Sokabe Megumi is revealed to be a student of the same women’s university the girls want to go to. December 2009, Dec 24, 2009 The juniors prepare a (surprise) Christmas party for the seniors in the club room. Dec 31, 2009 The girls gather at Yui’s house for a study session. January 2010 The seniors go to take their entrance exams. First appearance of Yui’s and Ui’s parents. February 2010, Feb 14, 2010 The juniors are preparing Valentine’s Day sweets. Seniors’ entrance exams results are revealed on Valentine’s Day. March 1, 2010 The seniors graduate. Everybody gathers in the club room for the last time. After the seniors leave, Ui and Jun come to join the club. April 2010 Morning of the university entrance ceremony. First appearance of Wada Akira, Yoshida Ayame, and Hayashi Sachi. April 2010 University entrance ceremony and club recruitment. April 2010 Azusa and Ui try to change their look. The girls come to the club room for the first time in the new school year. First appearance of Saitou Sumire. April 2010, Apr 18, 2010 First visit to the university’s Light Music Club. Afterschool Teatime and Gang Of Girls perform at the welcome party. First mention of Akira’s guitar’s name. First appearance of Yoshii Kana (club president) and Hitose Chiyo. April 2010 Azusa performs solo at the welcoming concert. Sumire is persuaded to join the club. First appearance of Okuda Nao. Spring 2010 The girls make new friends, schedule their practice time at the club and learn about the membership fee. Spring 2010 The girls decide on the parts and come to the music store to buy instrument for the new members. Spring 2010 Everybody gets a part-time job. Mugi spends time with Akira&Co. Spring 2010 Ui becomes the guitarist. 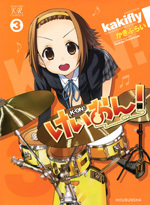 Sumire becomes the drummer. Nao almost leaves the club, but in the end finds a role for herself. Spring 2010 A glimpse into Akira’s high school days and the reasons behind her appearance. Spring 2010 The girls talk about siblings and later run into Jun who appears to be on a date. Sawako comes up with a name for Azusa’s new band. Spring 2010 Yui’s personality suddenly changes. Club president proposes a contest between Afterschool Teatime and Gang Of Girls during the culture festival. Spring 2010 Azusa, Ui, and Jun go on a field trip to Kyoto. Juniors stay behind with Sawako. 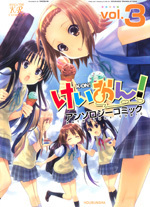 Spring 2010 Mio and Ritsu spend time with Sachi and Ayame. Spring Break 2010 The juniors hang out at a cafe after supplementary classes. Jun gives a bit of pep talk to Azusa and Ui. June 2010 Nao tries to discover Ui’s weaknesses. Spring-Summer 2010 The girls talk about a legendary band that was once a part of the club. Mio accidentally discovers the senpais’ secret. June 2010 Relationship between Sumire and Mugi is revealed. Sumire provides a glimpse into their childhood together and the reasons behind some of Mugi’s personality traits. Sawako explains why Sumire ended up in the Light Music Club. Summer 2010 Akira teaches Yui guitar terms. Ritsu seems troubled. Mio worries about her and tries to help. Summer 2010 The training camp is held at the largest of Mugi’s villas. Nao writes “Answer”. Azusa becomes the vocalist. Summer 2010 The training camp for the JWU Light Music Club is held at a mountain inn. Club President Kana makes members of different bands team up for the duration of the camp and give a performance on the last day. Summer 2010 Azusa, Ui, and Jun come to school for the supplementary classes. Jun tells a rumor about a ghost in the music room. Summer 2010 Yui comes home during summer break and meets Nodoka, who has a decision to make. September 2010 Girls begin to prepare for the school festival. Azusa spends time with the juniors. 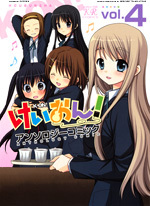 September 2010 Ritsu, Mio, Mugi, Ayame, and Sachi skip classes to chat. Yui and Akira stay after classes to make the club sign for the festival. September-October 2010 The girls are rehearsing the song Nao wrote for the festival. Sumire is worried that she cannot play her part correctly. In an attempt to cheer her up, Nao brings Sumire home for a sleepover. First appearance of Nao’s mother and brothers. October 23-24, 2010 Day of the festival. Yui (with Sawako’s help) secretly made T-shirts for the band. Afterschool Teatime and Gang of Girls have a band showdown as part of the Light Music Club concert. Gang of Girls wins based on the audience vote. After the concert Maeda appears. He works for a record company now and invites Akira to their office. Akira confesses her feelings to him and gets rejected because of her haircut. To everyone’s surprise, Akira refuses to give up on him and decides to stay in the university and grow her hair. She also tells Yui that the competition between them is not over. October-November 2010 (possibly November 3, 2010) Day of the school festival. Sawako sets up professional mixing equipment provided by a “powerful supporter”, so that Nao can mix live during the band’s performance. Azusa loses confidence in her singing ability for a moment, but Sumire manages to cheer her up. Fresh Leaf Girls performance is a success, but during the encore Azusa decides to play “Fuwa-Fuwa Time” (which they never rehearsed) with mixed results. After the concert the juniors thank the seniors for all their help. Azusa tells the juniors that they will continue to help them even after officially leaving the club. Thank you for all the hard work you have put into! ^^ I am eternally grateful for the translations you have done. It would be awesome if each of these linked to the blog post for that chapter, since there are enough total posts that hitting “older” to get back to earlier posts is somewhat of a tedious affair. Just a thought for your consideration. This is meant as a reference page, not as a main landing page for the whole site. This is great, thank you! Links to the readable chapters (at least the ones scanlated here) would be lovely as well. Oh, and may be asking too much, but info on the corresponding anime episode would be amazing! Volume 3 Chapter typo. Yu should be Yui. Did you mean vol. 4 ch. 10? If so, it’s fixed now, thanks. Yes I did. Sorry and thanks for the fix. I love it! This timeline is perfect for finding those little moments in the manga that I like to re-read because they make me laugh, but always take me ages to find (just the other day I was looking for Ritsu & Mugi’s day out, v3 c10). Just a suggestion and not that relevant to a scanlation site, but it would be cool if this timeline could be expanded to include the anime as well – to show the episodes that each chapter was animated as. Great post. The only inconsistency I think there is is Volume 3 Chap 2, the first appearance of Sokabe Megumi. While the anime makes it very clear that this scene was a flashback to their first year, I think this is still the case in the manga as we do not see Azusa in a single frame in this chapter. So what exactly is the inconsistency in my description? It is not a flashback in the manga because in the end of the chapter Nodoka is revealed to be the student council president and Megumi is about to graduate. Assuming Megumi graduated on Mar 1, 2009, the events of the chapter happen sometime in Feb 2009. Azusa is at the end of her first year and she’s been in the club for almost a year at that point. BTW KyoAni messed up big time with the whole “flashback to the 1st year” thing in ep.7 of season 2: if the “Mio’s stalker case” was at the end of their 1st year before Azusa joined, then Megumi graduated before their 2nd year began, but then how could the girls (Azusa included) be begging Megumi in the student council room to let them go on stage during the 2nd year’s school festival (at the end of ep.11 of season 1)? Also, Megumi is wearing green ribbon in season 1 which makes her 1 year their senior (consistent with the manga) but then in season 2 she has red ribbon (2 year senior, inconsistent with both the manga and season 1). So I wouldn’t use the anime as a reference. 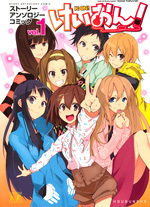 14: Volume 1 Chapter 13 from “Manga Time Kirara Carat 2008-04”. Thanks for the info! Updated. 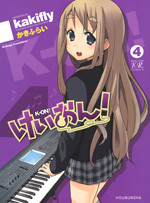 *?”Hajimete No Keion!” was distributed in Comic Market 75 (Dec 28, 2008). Wow! A thousand internets for the effort! Also thanks for the timeline.